Revered Anthousa faded from the earth and life. The holy princess Anthousa of Constantinople was the daughter of the Iconoclast Emperor Constantine V Copronymos (741-775) and his third wife Eudokia. She and her twin brother, the future emperor Leo the Khazar (775-780), were born on January 25, 756 or 757. 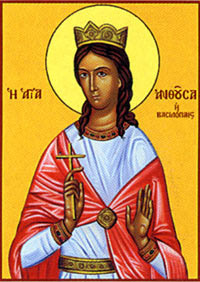 Constantine V had previously tortured the holy Abbess Anthousa of Mantineon (July 27) because she venerated the holy icons. During a campaign in Paphlagonia, he had her brought before him again, promising her even harsher torments if she did not come around to his way of thinking. She remained steadfast in defending the icons, however. Constantine told her that his wife was having difficulty in her pregnancy, and he asked her to pray for the empress. She agreed to do so, and told him that his son and daughter would be born safely, and even spoke about their future life. Empress Eudokia's daughter was given the name Anthousa, in thanksgiving for the safe delivery of the twins. When Saint Anthousa of Mantineon's prediction was fulfilled, she was allowed to return to her convent, where she died at a ripe old age. When the younger Anthousa grew up, the emperor began to urge his daughter to marry. But from her youth Anthousa yearned for monasticism and refused to consider his suggestions. After the death of her father in 775, this fragrant fruit from a putrid root shared her possessions with the poor, and used her wealth to adorn many churches and fund charity organization. She became a mother to orphans, and was also a protector of widows. She devoted herself entirely to a life of piety, constantly offering prayers to the Lord and reading the Holy Scriptures. The devout empress Irene (780-802), wife of Leo the Khazar, regarded Anthousa with love and esteem and invited her to be a co-regent. Anthousa, however, did not desire any worldly honors. Since she lived at the palace, she wore clothes befitting her position as an emperor's daughter, but underneath her finery she wore a coarse hair-shirt. As an ascetic in the palace, she had a strict diet and only drank water. Desiring a life of solitary asceticism, Anthousa entered the Monastery of Saint Euthymia, and received the monastic tonsure from Saint Tarasios, the Patriarch of Constantinople (Feb. 25). She founded the Eumeneia or Homonoia Monastery at Constantinople, which was known for its strict way of life. 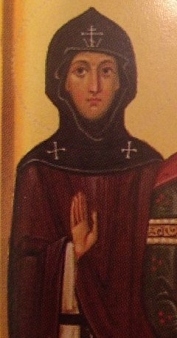 Saint Anthousa was an example of humility to the other nuns. She did hard work, she cleaned the church, and carried water. She never sat at the table during meals, but served the sisters instead. She made sure that no one left the monastery in need. The humble and gentle ascetic lived until the age of fifty-two, and died peacefully in 808 or 809.